I can't voich for the reliability of these folks, but here it goes: EntertainmentNews - Music, movie, EntertainmentBROLIN'S EX RECOVERING AFTER FREAK TRAFFIC ACCIDENTBarbra Streisand - © ddp2007-11-09 03:09:02 -The ex-wife of BARBRA STREISAND's husband JAMES BROLIN is recovering in hospital after a bizarre traffic accident.Actress Jan Smithers, a star of beloved U.S. TV sitcom WKRP In Cincinnati, was driving naked when she stopped for help after her car broke down on a remote California highway in the middle of the night.She was hit by a truck after the driver caught sight of the 58-year-old waving him down too late.She has been recovering from her injuries ever since the September (07) accident, but family members fear her health issues might be more than a few broken bones.A family friend tells U.S. tabloid the National Enquirer she fears Smithers suffered a mental breakdown following the death of her father.The pal says, "Everyone thinks Jan felt abandoned and snapped - a complete meltdown." Ironically, police called to the scene of the accident found nothing wrong with her car and are puzzled as to why the actress stopped for help.Smithers can't remember anything about the accident or why she was driving naked in the middle of the night.She and Brolin wed in 1985 and had one daughter, Molly, together. 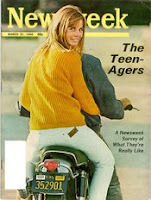 They divorced in 1995, three years before the actor wed Streisand. LOVE "Cheers". Anything you can share about it, Ken, would be awesome. JackFM streaming radio sometimes plays the "WKRP" theme, as well as other vintage TV show themes. The sad thing about WKRP today is, thanks to musical rights issues and the lack of faith Fox has in DVD sales (having acquired home video rights to the MTM shows), if you buy Season 1 of WKRP, you're not going to get anything near what most of the shows sounded like on their original network or even syndication runs, because only a few of the original songs used are still there. The others have been replaced by either alternate tunes or generic music (which at least shows the studios are as cheap to ASCAP and BMI music rights holders as they are to the writers when it comes to non-broadcast royalties).Fortunately, the original words are still there, and the Thanksgiving episode was one of those that wasn't dependent on current music. Credit where it's due: WKRP theme music: Tom Wells; lyrics: Hugh Wilson. 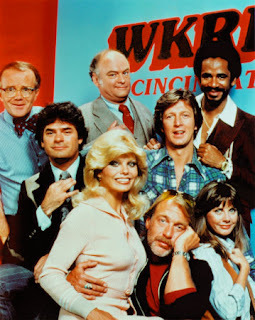 Does anyone remember "The New WKRP in Cincinnati," which I suppose got produced on the strength of the original's syndication success? Don't recall ever seeing it, but I get the impression it's about as fondly remembered as "After MASH." Michael Des Barres and Tawny Kitaenstarred in the "new" WKRP. Not sure why I know that, but there it is. Thanks for the MP3, Ken!You are a champ! One of the writers on The New WKRP -- Doug McIntire -- is the morning drive host on L.A. talk station KABC. He was also a writer toward the end of Married with Children.And remember: "Police Academy" jokes might have been low, but the series was a very successful franchise. If I were in the business of taking pitches, my door would always be open to Hugh Wilson. Same thing happened with Crime Story. I was really looking forward to the DVD release until I discovered that much (probably most) of the music had been replaced by cheap generic stuff. That show owed a lot to the music, supervised at various times by Todd Rundgren and Al Kooper. What country has recently gained or lost a freedom? I am doing an assignment, in which I need to choose a country which has recently gained or lost a freedom to report on; I am trying to find an interesting country for the subject matter.